And if you would like to save a little money in the process of protecting the big panting pup, you should consider buying this Advantage Multi 12 Pack, which will prevent you from having to empty your wallet for another six months. This powerful topical is only applied once a month, and is proven effective against these potentially life threatening parasites, so grab your supplies in bulk today. Can I use it at the same time as an Advantic or Drontal? Yes, you can use this product with Advatix or Drontal safely. Is there a difference between Advocate and Revolution???? They are cover the parasites, however Advocate and Revolution are completely different products with different ingredients and formulas. There is absolutely no difference between Advocate and Advantage Multi. 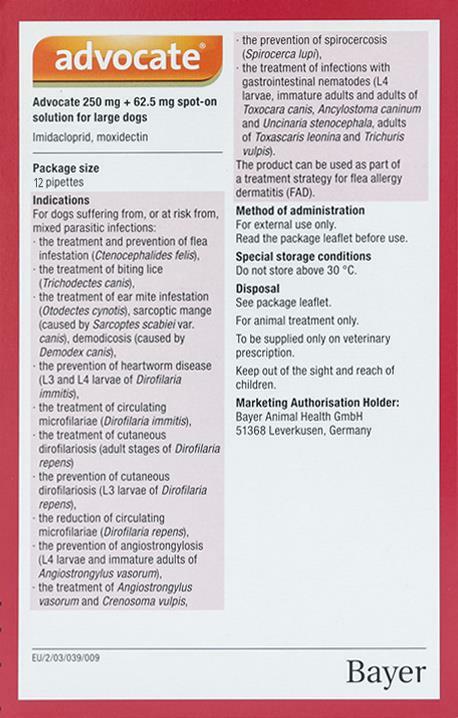 The manufacturer - Bayer - markets this product as "Advocate" in the UK and Australia and "Advantage Multi" in the US. You can use Frontline with Advocate/Advantage Multi. Can this product cover all kinds of mites and ticks? there are Haemaphysalis longicornis in my contry. Is this product comparable to Revolution? Yes, it covers the same parasites, however it has completely different active ingredient. The product is exactly what I ordered. The price was great. I will recommend this company to all my friends.